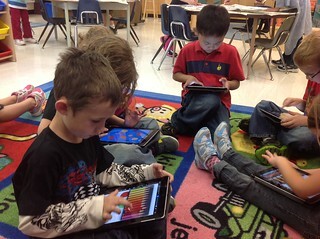 This article was also posted on the kinderchat blog. More and more primary teachers now have access to technology in their classroom. Whether it is an iPad or an iPod touch, a desktop or a laptop, a growing number of teachers are either being given access to this technology by their school boards or bringing their own devices to class to help students to learn. Because of the multitude of choices and opportunities that technology enables, this is a positive development. I have been concerned, though, by some of the ways that I see technology being used. Technology should not just allow us to do things in a more engaging way; it should allow us to do new things that we thought were not possible. It is those new things that are the real value technology provides. It is not enough to USE technology. You must use it well. Having access to books does not mean that the students in my classroom will learn to read. I need to make careful pedagogical choices and use those books in a way that will gently and purposefully help those children to become independent readers. Very few children can make this leap themselves. Most need a thoughtful teacher to guide them. In the same way, having technology in my classroom does not mean that my students will discover how to use it as a learning tool. I have to carefully select and structure what it is used for so that it becomes truly educational. As with reading books, should not our goal be to develop independent learners? Here are my personal abuse and use lists for the handling of devices in the classroom. Technology should not be used as simply a digital worksheet. There are many apps and Internet sites available that are simply a technological version of a paper task, forcing students to practice over and over a skill that they may already have mastered. Don’t get me wrong. Skills do need to be practiced. I just happen to think that students should spend most of their time using technology for more creative purposes. Technology should not be used to do what can be done without it. Drawing a picture on an app or a computer program and labeling it is a worthwhile activity, but why bother if that activity is an end in itself? It may as well have been done on paper. Technology should allow you to do something new with that picture, such as sharing/publishing it in some way. The good news is that there are other, better options for using technology. My heart does a happy dance when I see these. Technology should be for accessing what was inaccessible. In the past, my teaching materials were limited to what was in my classroom and in the school’s library. Now there are a plethora of materials available online to fill any teaching need I have, limited only by my online search skills. From classroom-ready videos such as those of Mercer Mayer and Dr. Jean to sharing and learning with other teachers on Pinterest or Twitter to accessing the creative commons photos of thousands of photographers—well, let’s just say there is no longer an excuse for not having appropriate resources. Technology should be for doing good things in better ways. For example, hearing books being read aloud is an important part of primary literacy. Long ago, listening to books on a cassette tape became listening to books on a CD. Now, there are online books and apps that do a much better job of this, highlighting the words as they are read aloud. Technology should be for sharing with the world. The environment that our students are growing up in is wired for sharing. The hardware and the software that is available make it easier every day for children to share what they are learning with the world. Even young children can share their learning using drawings, images, blogs, video and digital portfolios. By sharing their artifacts digitally, students invite the involvement and support of their parents, grandparents and anyone who sees their work. Technology should be for connecting. Before the advent of the Internet, classrooms were forced to be isolated learning hives. Now, those hives can all be interconnected as classrooms can easily link with other classrooms and experts to ask questions, compare experiences and learn together. Tools such as Skype, Twitter and blogs make connecting and collaborating with classrooms from anywhere a possibility. Technology should not just allow us to do traditional in a different way; it should allow us to do things that we thought were not possible. How Can I Get Followers For My Classroom Twitter Account? Thank you for the reminder of how to really use technology in our classrooms. Technology can be such a great tool in the classroom, but it is just a tool that needs to be used appropriately. It’s a great reminder as we head back into our classrooms for the new year. Thanks, Jenni! That was my hope in sharing the examples. Like any proud teacher, I do love to show off what my students do. They inspire me every day. Going to mail this to every single elementary teacher on staff…. You have given me some points to ponder. Bringing technology into the classroom is motivating and engaging for students. However, you are correct when saying it should be more than that. Your analogy of the of accessing books in your classroom as I think it drives the point home. A fabulous post Kathy and one I couldn’t agree with more. Nothing frustrates me more then when someone asks me to recommend a math app to practice a drill and practice skill. What an expensive way to practice such a skill. Watching my students create things, and share their creations with the world is an exciting way to teach and learn. And how exciting to easily bring the world into our classroom with technology. 🙂 I love working and learning along side of you and I’m pretty sure there will be more “wow, why didn’t think of that” moments shared. I learn so much from you, Karen. It has been a pleasure to see the exponential growth you have experienced over the last year and a half. Great list! It can be easy to use technology just for the sake that it is there and then all of a sudden we’ve forgotten what we can actually accomplish with it. I am sharing this list! Thanks for the reflective reminder of what is possible, even at young ages. I’ll be sharing this with our primary teachers! Thanks, Sheri! I am a big proponent of the “little kids can” movement. Kathy también te leemos en Español. Muy acertado. Desde España. Thanks so much for the excellent examples that you have incorporated into your post. I am hoping to encourage those that I work with to push their comfort zone and move into creation and discovery rather than using our technology to do old things in a new way! Is it OK for me to put a link to your article on our staff blog? Of course it is! I would be honoured. Thanks for your encouragement. Amazing. Just as I finish my two week holiday I am ‘gifted’ with finding your blog. You have captured my total philosophy, and better yet, I have hours of perusing your websites to be inspired and renewed as I start into this new year with my all boys first grade. Little kids CAN…I love. I certainly didn’t mean to denounce practice type apps, only their mis-use. I hope I made that clear. Thank you for providing another perspective. Thank you for taking the time to post this. Teachers here in the UK just don’t seem to have the time to do the research or work within their community of practice here to develop the use of IT. Maybe that’s why they fall back to what is ‘easy’ or well tried even if it is not the best practice. Just written a chapter in a new book to try to get student teachers to ask themselves how they are going to approach the use of IT in the classroom (out in mid Jan). All profits are going to fund our Canterbury Christ Church University student teachers with international projects. Thought-provoking. And an excellent list of the principles exemplifying good practice. Have already shared it in a couple of groups/lists and will share it with my teacher trainees. Thanks for a good article about these so important questions. I’m going to tell my teachers and recommend them to read it. I’m teacher in fine arts for young people and I agree with you. It is difficult to balance a “manual activity” and other “technological”, if we forget the the skills that characterizes us as human beings. I am nearly eighty. In spite of being a graduate in the sciences I am something of a technophobe when it comes to using equipment of most kinds. I have a son who is the opposite of me in most respects and through whom I found your article. He is an enthusiastic advocate of education via modern technology. Yet I keep wondering whether, in spite of all its advantages the modern gadgets may make us lose touch with our roots. We have already done so. To put it plainly should childhood have a strong ingredient of tough ways of growing up, from hard memory work learning tables, poems, facts, and not just the internet for ready reference? I could say more but would guess you already have the idea. Kind regards. Great to have you comment on my blog! I applaud the fact that you are continuing to learn with technology. I am a highschool student creating a documentary for an English project on this specific subject and I would just like to say thank you for the inside on what its like inside a primary school with the technology accessible to younger ones. As a highschool student only some classes have this opportunity, but as a student I see many of my classmates not use the technology to their advantage during class. I see many students looking up answers instead of using it as a tool to aid learning. Really great article and highlights the fact that technology should not be used just for the sake of technology. My name is Cari Raymond. I am an EDM 310 student at the University of South Alabama. As part of our class projects we are assigned different teachers from around the world to read their blogs, learn from what they have shared and leave our comments or questions on their blog. About two weeks we can comment again and then one month later we post a summary of the post we commented on as well as our thoughts. 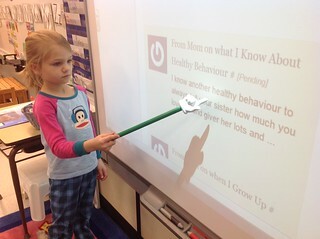 This way everyone in the class can share what they have learned and how we can apply these findings in our future classrooms. I will be posting the summary on my blog Cari Raymond’s EDM 310 Class Blog on March 10, 2013. Thank you. I agree that simply having computers in the classroom will not guarantee that the students will learn any better than if there were only books. Teacher need to show their students how to use all form of technology properly in order for them to continue to use it even after they have left their classroom. If a child sees a computer as a means to play games then when they enter college they will struggle to learn because they lack the knowledge of all that a computer can do. It is the same as the saying “give a man a fish he’ll eat for a day but teach a man to fish he’ll eat for life”: if a teacher shows how to use what a student already knows to achieve their goals then they will continue to keep wanting to learn. Last year my mom showed me that with Google I could use the Drive section to send papers to my group members and when they made changes it shows on all of them so that even when we could not meet we could still keep working. This helped me in many ways but once I saw that there was so much I did not know about an item I use nearly every day I wanted to know more so that I could do and be more than I was before. I am glad that someone has finally listed the cautions that teachers need to take when using technology in the classroom. I do not want to see my classmates have wonderful ideas to help their students learn but not see the damage they are doing by not teaching how to use it correctly. Thank you. Thanks, Cari. I’m glad you are beginning to see the value in connected learning. There really is much to think about when using technology with young students. Thank you so much for this great post! I’m doing a PD about how to incorporate technology in the classroom and I am going to start by sharing your blog post! Great to hear, Monica! Good luck with your PD. You are true in your statement. I totally agree with. Technology is an adder. It just helps us to DO things which WE cant do without it. I’d like to think we could make using technology in the classroom as engaging as using technology outside of the classroom. I encourage my students use their personal devices in my middle school science class to follow my posted mini-lectures, take notes, and “Google” topics that they find interesting and to answer their “wondering” questions on the spot. I don’t know if this strategy for engagement will improve test scores, but it has definitely made my classroom a more exciting place and has raised the level of engagement. Thank you for such a well written article. I read this in comparison to a problem I had to identify for my college Education Technology class: the misuse of technology in the classroom. I think your ideas were well thought and I agree with completely about how technology should be monitored in the classroom. Technology should not replace what is already available but be used when something is not available. My concern is how technology can be abused by the students within the classroom during class time; I fear that when given free reign, they will become distracted with all the applications they have access to. It sounds as if the teacher needs to be on top of this inevitable situation and with a good eye and honesty with their students, it can be easily avoided. Thank you for your honest and strong opinions, they have helped me see what it may be like to be a teacher within this now technology savvy world. I look forward to working honestly with technology and learning the correct and most effective ways to work with it. This has helped me tremendously in seeing what it means to be a teacher surrounded by options of technology. Thank you again! Pingback: Integration of Technology into Teaching Practices. | PLEASE DO NOT CALL ME MADAME! All the statements are true. As a future educator, it can be the guide to us to manage the classroom. Technology may be changing the experience of education, but the role of teachers and parents grow increasingly important as they become the experts and guides for new learning resources. Thank you for your thoughts and ideas about the proper using and abusing technology in the classroom.